Far-ranging and versatile, tiny goitered gazelles thrive under a wide variety of conditions, from hot summer sun to blustery winter snows. Their sandy coloration and swift feet help protect them from predators as they travel in search of plants to eat. Goitered gazelles eat about 30% of their body weight in herbs and grasses each day. They get most of the water they need from their food. Deserts, semideserts, hilly plains, and plateaus are the preferred habitat for these always-on-the-move animals. 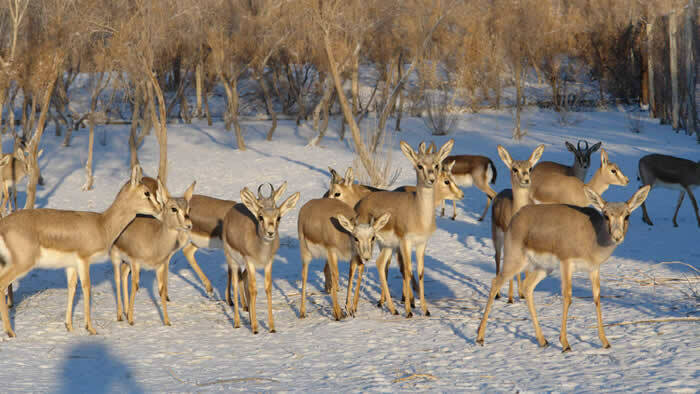 Goitered gazelles have the broadest distribution of any antelope, found from the sun-baked Arabian Peninsula in the western part of their range to the snow-blasted steppes of Mongolia in central Asia. Goitered gazelles spend most of their time walking and grazing, but can run when needed at a quick 36 miles per hour. In summer, they live in small family groups, avoiding the heat of the day by digging and lying in shallow pits. To stay warm in winter they gather in larger herds and migrate to valleys protected from the fierce wind and cold. Estimated numbers of 120,000–140,000 in 2001 seem sustainable and safe, but increasing habitat loss and illegal hunting suggest a different story. In Mongolia, for instance, populations that were stable for decades recently dropped 50% due to poaching. 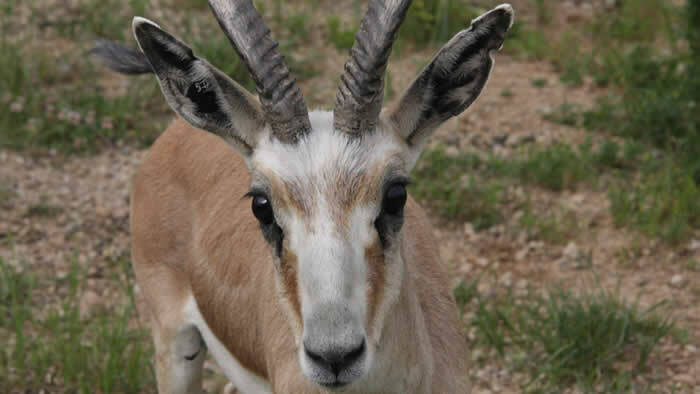 The goitered gazelle gets its name from the goiterlike swelling on the throat of the males during breeding season. During breeding season, male goitered gazelles develop an enlarged throat and drop piles of dung in strategic spots to mark their territory. Unlike other gazelles, goitered gazelles generally give birth to twins. The young lay camouflaged for the first two weeks of life. The mother grazes nearby and nurses her young about three times a day. Hunting for goitered gazelles is big business in Asia. A 10-day hunt costs more than $16,000. 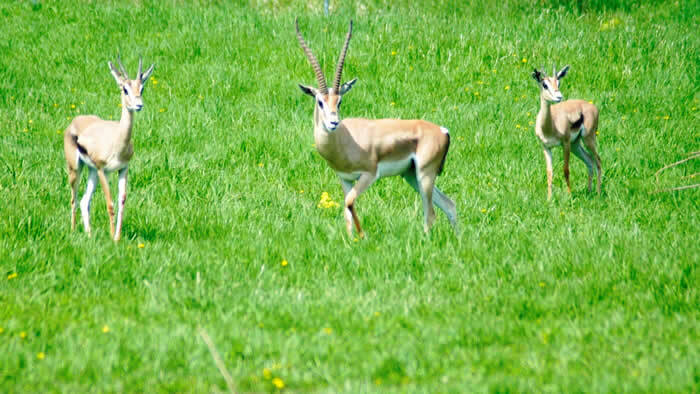 Other names for the goitered gazelle are the Persian gazelle and the black-tailed gazelle. The goitered gazelle was listed as a vulnerable species by IUCN in 2006. Its range is shrinking, and populations declined more than 30% in 10 years due to hunting, poaching, and habitat loss.